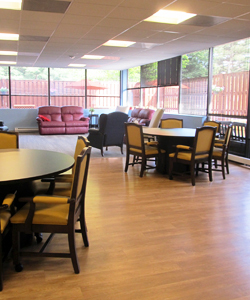 In January 2015, we relocated our center to Fair Oaks on Pender Drive. 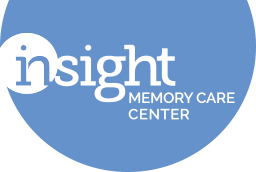 This state-of-the-art center provides 15,000 square feet for our care, support, and education programs. Read more about the features below or watch our Virtual Tour! Coming in the participant entrance you enter the dining area and kitchen, a spacious area with seating for 60. 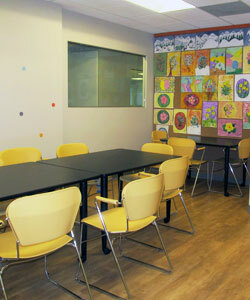 A separate room provides dedicated space for art therapy, as well as arts activities throughout the week. 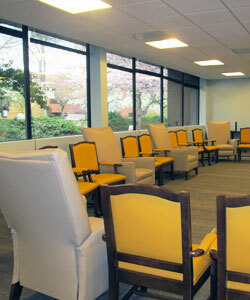 The main activity room provides a large space for big group programs, and can be divided for smaller activities. 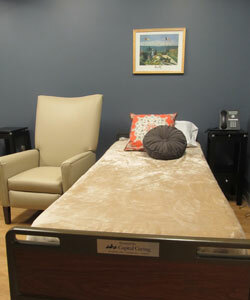 A room for physical therapy allows for individual sessions with physical, occupational, and speech therapists. 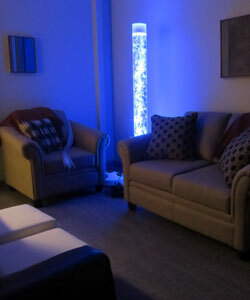 This room uses sensory stimulation to calm those who are agitated, or awaken those in the later stages of the disease. Showers can be provided in a separate bathroom. 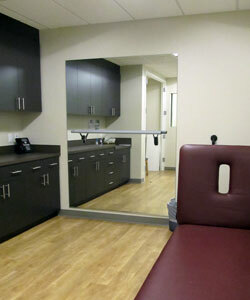 The bedroom and nurses station all adjoin to provide optimal care. 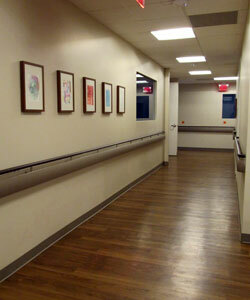 The day center layout is designed for dementia; conducive to wandering with no dead ends. 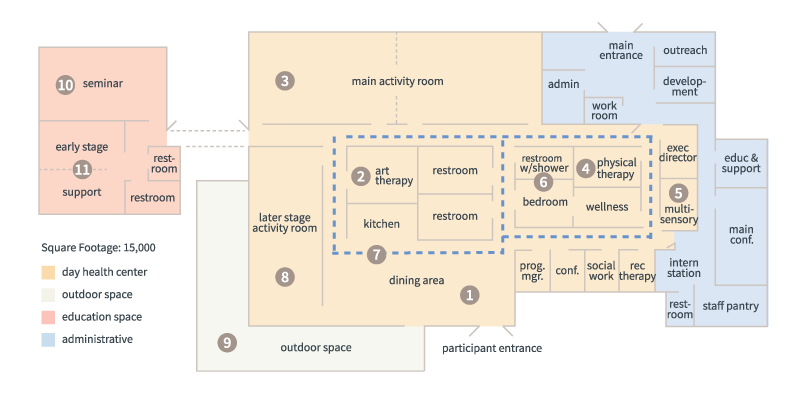 Late stage participants receive individualized activity plans and more one-on-one assistance with activities. 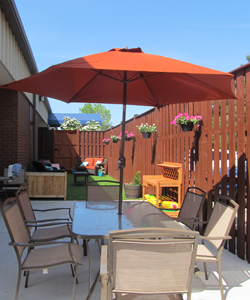 1,000 square feet of outdoor space with areas for gardening, active games, activities, and conversation. 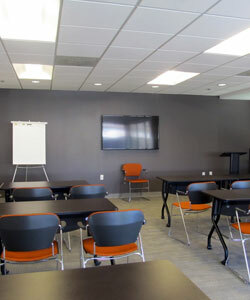 Dedicated seminar space for educational programs, support groups, workshops and more! 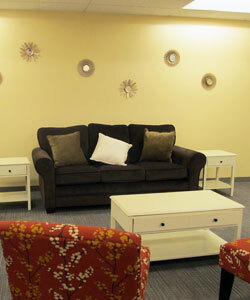 Dedicated, separate space for our early stage programs, Reconnections and the Mind and Body Workshop. "I believe the person with Dementia thrives in this environment. 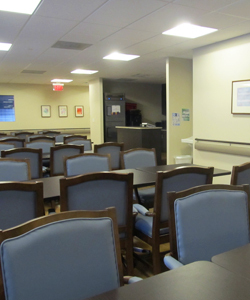 What amazes me when I am at the center, whether it be morning or end of day, is the pleasant, kind and friendly atmosphere of both the staff and the residents. It is a culture of caring and respect."